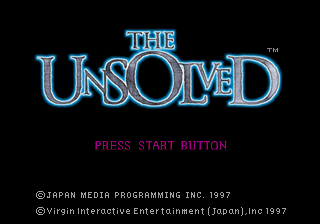 The Unsolved: Hyper Science Adventure (ジ アンソルブド) is an adventure game for the Sega Saturn. The game features live-action footage of American actors, speaking English with Japanese subtitles, despite being an entirely Japanese production. Finance Coordination by: "Oz Co. Ltd."
Associate Production: Gpa Usa Inc.
Ending Theme: "Chou -The Unsolved Version-"
Song by: Ayumi Shimizu/Toshiba Emi Ltd.
(C)1997 Japan Media Programming Inc.
(C)1997 Virgin Interactive Entertainment (Japan), Inc.
Virgin Is A Registered Trademark Of Virgin Enterprises Ltd.
Main article: The Unsolved: Hyper Science Adventure/Magazine articles.